Further down on this page, you can download spell check dictionaries for AceText in many languages. Note that these dictionaries will only work with the full version of AceText. The spell checker is not available in the free evaluation version. AceText's Live Spelling will mark each misspelled word as you type, without asking you to correct it. You can correct your mistake simply by retyping the word. If you double-click on the word, you can select a correctly spelled word from a list of alternatives. 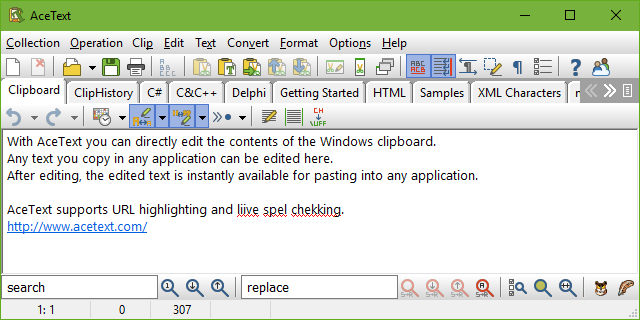 Use AceText's AceEdit feature to instantly edit and spell check any text you've selected in any application. AceEdit will instantly send the corrected text back to that application when you're done. The easiest way to download and install spell checker dictionaries, is right within AceText. In AceText, click on the Preferences button on the toolbar. Switch to the Appearance tab in the Preferences screen. Then click on the download button at the bottom. Select the language you want, and click the Install button. If a firewall or company network policy prevents AceText from connecting to the Internet, you can download the spell check dictionaries below. To install a dictionary, double-click on it in Windows Explorer after downloading. The installation program will ask if you are sure you want to install the dictionary. No other questions will be asked. Important: If you manually install dictionaries, rather than downloading them within AceText, AceText will only detect new dictionaries when you start it. If you install a dictionary while AceText is still running, it will not appear until you have closed the application and restarted it. Right-click on the AceText icon near the system clock and select "Shut Down AceText" to completely shut down AceText. As long as the tray icon is visible, AceText is still running. The same dictionaries are also used by the spell checker built into the text editor EditPad Pro and the help authoring tool HelpScribble.